There are guns blazing, mysterious winged creatures, a symbolic tattoo, an elusive blue elixir, an unresolved murder and big stunts, yet Max Payne is surprisingly lacklustre. 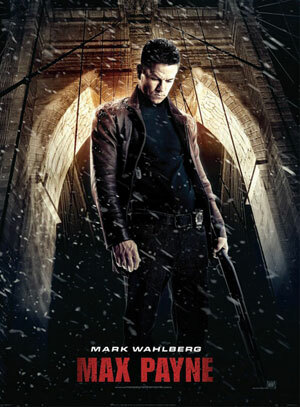 Based on a video game, there’s plenty happening on screen, but it’s hard to feel much for any of the characters, even Mark Wahlberg’s brooding Max, who is obsessed to avenge the senseless murder of his wife and child. The storytelling is secondary to the action with adverse results as director John Moore battles to create a credible world couched between reality and fantasy. To me, the most striking element is the production design in which perpetual snow falls, gusts whirl over a snowy backdrop and torrential rain teems down soaking volatile characters at vulnerable moments. When we first meet Wahlberg’s Max, he is freefalling in an ocean filled with dead bodies. In voice over, we hear that it is not heaven, in which he believes, but pain, fear and death. We quickly understand the world in which Max lives: one that involves loneliness, regret and hate. We watch in superficial fascination as Natasha (the stunningly beautiful Olga Kurylenko) tries to seduce Max, wearing a flimsy, ultra short red silk dress with thigh-high black boots, but he is only interested in her tattoo. Then there’s Natasha’s hard-nosed sister Mona (Mila Kunis, unrecognisable from her likeable character in Forgetting Sarah Marshall), Chris O’Donnell as a drug company executive and Beau Bridges as BB Hensley, head of security. Frankly it’s hard to believe any of them. Amaury Nolasco however, is terrifying as Jack Lupino, whose handsome features are decorated by two large facial tattoos and whose demons come alive all too often. There’s no shortage of firepower (Max shoots everyone in sight) and even if you ignore some of the plot’s unanswered questions, we are left with a cavalcade of bullets, noise and chaos. The sum of the parts is more impressive than the whole and more’s the pity.